Hyundai recently introduced the 2nd generation Veloster, a car that’s unlike anything else on the road. We hear a lot of marketing BS about 4-door coupes and 4-door coupe SUVs, thankfully Hyundai didn’t go that route, although they could’ve called the Veloster the “4-door hatchback” (because hatchbacks have odd number of doors, for some reason the “trunk” door is counted as a door). The Hyundai Veloster as an asymmetric design, with one door on the driver’s side and two doors on the passenger side, the third door not only makes it easier to get in the back seat, but it’s also a sort of safety feature, ensuring the rear passengers don’t get out of the car on the side where cars are passing. For 2018 Hyundai has completely redesigned the Veloster, while still keeping a similar overall shape to the previous generation car, which was introduced in 2011. I did have an opportunity to drive the first generation Veloster for a few days and I wasn’t a big fan, mainly because of the automatic transmission. A couple of weeks ago I spent a week behind the wheel of the all-new 2019 Hyundai Veloster with a manual transmission, my experience with this car was a much better one than the one I remember from a couple of years ago with the first generation Veloster. 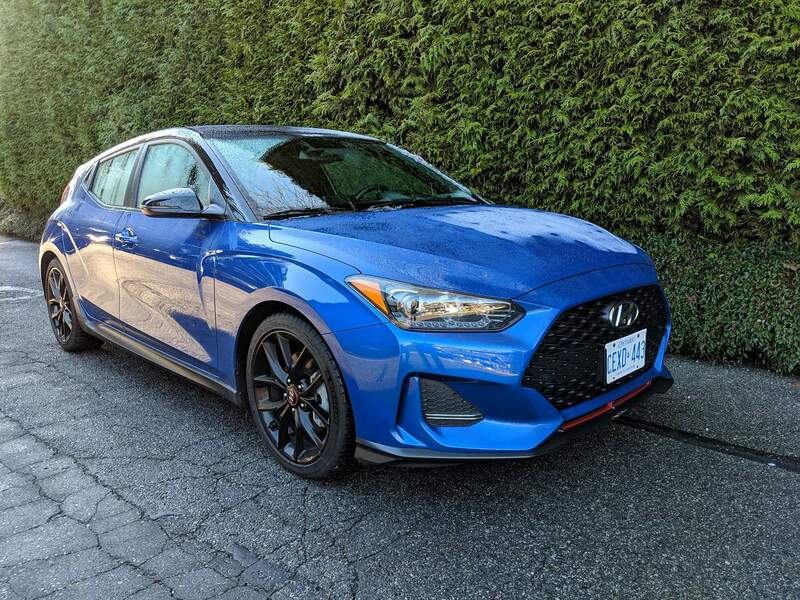 Our review car for the week was the 2019 Hyundai Veloster Turbo Tech with the Performance Package, for a total price of $31,379, this price includes $400 for the two tone/pearl pain, $125 in “other taxes & levies”, and $1,705 for delivery and destination. The 2019 Hyundai Veloster is offered with two engine choices, the base engine is the Nu 2.0 liter 4-cylinder, producing 147 horsepower at 6,200 rpm and 132 pound-feet of torque at 4,500 rpm. The other engine is the GAMMA 1.6 liter turbocharged 4-cylinder, with direct injection, producing 201 horsepower at 6,000 rpm and 195 pound-feet of torque between 1,500 – 4,500 rpm. This engine features an over-boost function, increasing torque to 202 pound-feet under maximum acceleration. The 2.0 liter engine is mated to a 6-speed automatic transmission, while the turbocharged 1.6 liter engine can be paired with a 6-speed manual or a 7-speed dual-clutch transmission. Both of these engines come with three driving modes: Normal, Sport, and Smart. The turbocharged engine equipped cars also come with “Active Sound Design”, which is fake sound being pumped into the cabin, especially under spirited driving. Our review car was equipped with the 1.6 liter turbocharged engine and came with a 6-speed manual transmission. The last time I drove the Veloster, a few years ago, I didn’t enjoy it at all, mainly because of the automatic transmission. Thankfully, the second generation Veloster is much improved and thankfully our car was equipped with a manual transmission, sporty cars like these should always have the option for a manual transmission. I enjoyed driving the 2019 Hyundai Veloster quite a lot, it’s very nimble and fun to drive around town. The 201 HP is more than enough to give you a smile every time you drive this small car, and the manual transmission is very fun to change gears with. Hyundai is bringing an even hotter version of the Veloster, called the Veloster N, which has a 275 HP output, I’m sure that car will be an even bigger smile machine. Driving the Veloster turbo around town is fun, but you must keep the revs above 1,500 rpm, anything below that and the car feels like it hit a brick wall. That is nothing new, all the cars I’ve reviewed with small turbocharged engines like this act the same way. Brining the rpm above 1,500 makes the car feel alive and very sporty and putting it in the Sport mode makes the throttle response just a little sharper. In Sport mode, the steering also feels heavier, nothing changes in terms of steering ratios, it just gives you a heavier steering feel. The steering feel is non-existent, I couldn’t really feel what the wheels were doing, which is unfortunately starting to become the norm with most new cars that are not outright sport cars (a lot of sports cars are even going this route). Driving and passing on the highways is also very easy, if you want to accelerate quicker at highway speeds, you have to have the revs above 1,500 rpm, otherwise you’re not passing anyone. The suspension on the Veloster is a nice balance of sport and comfort, it’s not too harsh in the name of being sporty and not too soft. The suspension feels sporty enough on twisty roads and won’t knock out your teeth fillings on rough roads. Personally, I think the 2nd generation Veloster is a pretty good looking vehicle, much better looking than the car it replaces, which had rounded edges versus the new one, which has more straight lines and the front fascia is in line with the rest of Hyundai vehicles. The Veloster keeps its signature 3-door asymmetrical design of two doors on the passenger side and one door on the driver side. The interior on the Veloster has a very simple and easy to understand layout. Everything you need to drive and enjoy that drive, is within easy reach and it takes no time to learn what button is placed where. As with other Hyundai products, the Veloster can be equipped with a lot of tech gadgetry. The interior looks very sporty with the black leather and red highlights on the seats, steering wheel, and a few other places throughout the cabin. A flat-bottom steering wheel would have made the car’s interior look even more sporty. Our review car came with a Heads-Up Display, which I find quite useful, however on our review car it didn’t work about 25% of the time. It’s one of those units that pops up when you turn on the car, but 25% of time it wouldn’t deploy, it felt like it was getting stuck on something. The interior is comfortable and surprisingly roomy, there is liberal use of hard plastics throughout the cabin, but this is not a very expensive vehicle, so I’ll give it a pass on that. Rear seats on coupes/hatchbacks like these are usually pretty tight on legroom, however the Veloster has a surprising amount of room, but due to the raked roof and smaller windows, rear seat passengers do find it claustrophobic. The addition of the third door on the passenger side is great for getting in and out of the back seat, instead of fiddling with the front seat to get to the back seat. Hyundai is known for offering a lot of tech/convenience/safety features in their cars, the type of tech you’d find in much more expensive vehicles, the Veloster is no different, it can be loaded up with a lot of features, below is just a highlight of some of the features you can expect to get in a 2019 Hyundai Veloster. The 2019 Hyundai Veloster is a very fun little sporty car, it’s a much better driving car than the 1st generation Veloster, especially with the 6-speed manual transmission. I had fun driving the car for a week and even had passengers in the rear seats. It’s a more practical car than a 2-door car, thanks to its third door on the passenger side.